DUBLIN 2, Ireland, 10-Oct-2018 — /EPR FOOD & BEVERAGE NEWS/ — The Europe non-dairy toppings market revenues continue to head north, as the growing vegan population ramps up demand for non-dairy ingredients. Shelves and aisles across European retail stores and hypermarkets have been observed with heightened penetration of dairy-free ice-creams. Higher visibility of non-dairy products on retail shelves substantiate the heightened demand for ingredients used to process such products, and non-dairy toppings are no different. Over the years, the number of Europeans preferring non-dairy dairy products has increased significantly, and by second quarter of 2018, over one percent of European population was identified to be vegan, says a report published by Fact.MR on non-dairy toppings market. The number of vegan population in the UK alone has increased by 350% within a decade. Among the people who have embraced veganism in the U.K., nearly 63% are women. Observing this shift, leading UK retailers such as Sainsbury’s and Tesco have introduced new range of vegan products. While the demand for vegan products and ingredients has amplified in Western Europe, frozen desserts and ice-creams are witnessing a surge in demand. According to Fact.MR’s study, the popularity of non-dairy products is relatively higher in Germany, with over 60% of the Germans showing interest in non-dairy ice creams and frozen desserts wherein non-dairy topping is used for processing. Non-dairy ice cream ingredients which accounted for a mere 1% of the total ice cream ingredients demand in 2012, have grown up to sizeable 8% share in a span of five years in Western European countries. The non-dairy toppings market has also been aided by celebrity endorsements and word-of-mouth by influencers on social media. This population base has translated into a sizable market for non-dairy topping producers, which have realigned their strategies to leverage the unfolded white space in European food & beverages market. People who opt for non-dairy topping based products had to compromise with their choice of food, and lactose intolerant population group forms the leading chunk of this population group. Lactose intolerant individuals are allergic to food that contains dairy products, and are on targeted dietary plan such as Whole30 and the Paleo diet. 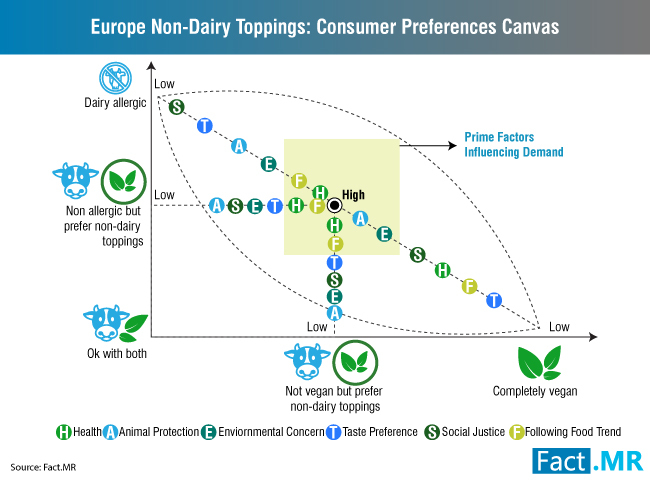 With about 65% of European population reckoned to be lactose intolerant, and North European countries leading the list, the widespread preference and adoption for non-dairy topping is evident. Furthermore, companies engaged in production of dairy based products also received consumer feedback of introducing key brands in non-dairy variants, and a few handful of market actors considered. European food & beverages market witnessed over 35 such product launch in last six quarter with non-dairy claims and almost 15 of those using non-dairy toppings.